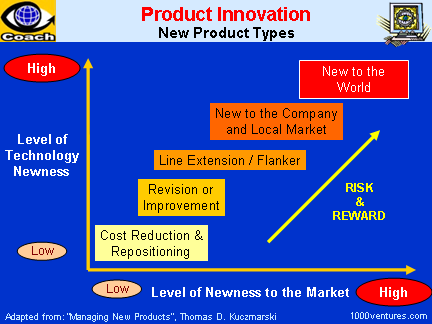 Hard Innovation is organized R&D characterized by strategic investment in new product development or improvement. Soft Innovation is the clever, insightful, useful product ideas that just anyone in the organization can think up. According to Phillip Kotler, a product is anything that can be offered to a market for attention, acquisition, use, or consumption that might satisfy a need or want. Thus, a product may be a physical good, retail store, person, organization, place, or idea. The myth that products are developed by lone geniuses in their labs, who turn sudden inspiration into practical innovation "wasn't quite true even in Thomas Edison's day, and it certainly isn't true today," writes Michael Hammer.2 "Reality is far more complex. Talent and inspiration are necessary but not sufficient. 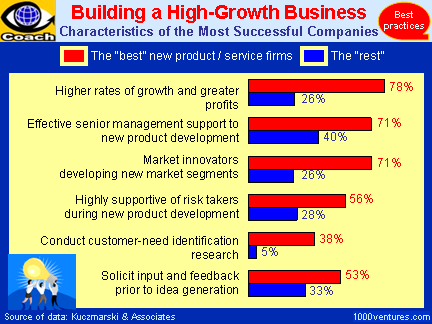 To create and launch nearly any new product today requires many people with many different skills." Marketing experts must assess the product's potential and help shape its specific features. Financial types must analyze the cost of marketing it and determine a competitive price. Manufacturing specialists must decide how to make the product in volume. Lawyers must assess how it can be protected from imitators. The improvisation-driven model for innovation project management doesn’t discard structure, just as there is a clear structure to good jazz. Long term corporate success linked to the ability to innovate. Although corporate investment in improvements to existing products and processes does bring growth, it is new game changing breakthroughs that will launch company into new markets, enable rapid growth, and create high return on investment. Companies that are not bound by prevalent fallacies and rules of conventional wisdom have been able to break out of the pack, create a new highly profitable market niche, and win customers.